This quote has been on my mind sporadically since I came across it. It struck something deep in me when I first saw it; since then, I have continued to let it roll around in my head and take on various meanings and inspire a variety of learning opportunities. At a glance it can evoke the feeling that lots of people say a lot of stuff that they don’t exactly live up to or in alignment with. Always too easy to see what others are getting wrong; feels much better to see what is lovable about them. It can also make one wonder about their own actions and if we ourselves are truly living what we speak about or living aligned with what we value most, etc. The old, “Actions speak louder than words,” can also seem the easy comparison or conclusion. Considering how we listen to others occurs to me as well…can I hear what isn’t being said or in some cases ignore what is being said and look at the actions? 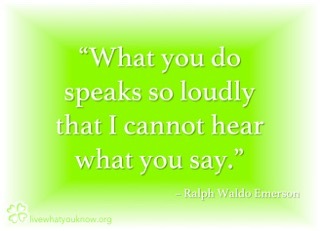 Can I look past actions or directly at them and hear or feel what is really being said at the deepest level? We may consider our deepest intuition and what makes us do the things we do, say the things we say, etc. To know that intuition well is to know the Miracle of Life. It knows what It is doing. Walking with our Divine Intuition is so much more relaxing (among other great and meaningful things) than walking with the smaller version of us that remains wrapped in fears and judgment. By leaning back and looking at the many versions of “me” we have known over our lifetime so far, we can ponder the changes and the versions we have seemed to be throughout the years. We may cringe at our younger years or hopefully just smile and love ourselves with gratitude for becoming more of the person/spirit we are opening to. We can awaken to the Divine Knowing of who and what we truly are. The shift happens…what we do, how we behave and who we are changes over time…we only need Live what Life would have us Know…it is always teaching us, guiding us and Loving us. The quote above can gently remind us to Live What We Know. Obviously, these thirteen words strung together by Emerson can lead us to consider a myriad of possible meanings; some inspiring, some disappointing. I think the key to getting the most out of something like this and just about anything we ever encounter is to look within and figure out what it means for us. We can observe how we choose to live and how that shift begins to show up in our daily lives and the things we spend our time doing. When we look at these words and apply them to what we think we see on the outside or in others, we may get stuck in painful memories or recall past experiences that can make us pretend to live in a world without enough Love. We must find the courage to look within and let these words comfort us in the moment of Life we are currently in as we do our best to BE and Live more of who and what we really are. On a personal note, I’ve been somewhere in the shift for many years. I now know that not everyone likes to see change or the beauty of fresh unfamiliarity in lifelong relationships or even newer ones. Our journey towards our truest self that is a lifeline for us is not always seen as positive by everyone. Sometimes others just cannot see us. Misunderstanding and the painful feeling of not truly being seen as we grow can be tough. Sometimes we have setbacks or things happen that can make it seem as though we aren’t moving far enough along the path. The pain can block us or clog our flow if we let it seem real for too long. Those setbacks are blessings. They are the blessings that awaken us to the truest part of Life…the One we are meant to Live. We must remember that we are just where we are meant to be in Life and at the perfect place to Open up and allow abundant Blessings for All to flow through us. May we all love our choices and see the shift in our lives today. May what we do speak of Love for ourselves as well as for others. May we know deeply that our intentions are pure and we are led by the Divine in Us. May we have compassion for others’ reactions to our choices without taking those reactions personally. May we unclog the flow of Life by surrendering and releasing guilt and see only the Oneness and Beauty that Life is beyond all the mirages caused by fear. May we be thankful and filled with gratitude for All. Sending you Love and Joy!